At my company, I was asked to teach a contractual out-service. This is a special contract setup between Berlitz and another company, to provide English instruction to that company's employees. Usually these lessons take place outside the typical class setting at a Learning Center. This particular contract is being taught once or twice a month at the company's main office very near Tokyo station in one of the many surrounding skyscrapers. 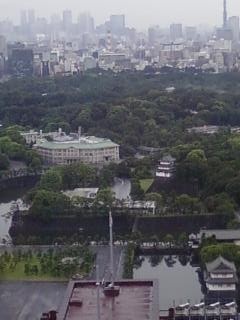 In fact, the office where I have been teaching has a spectacular view from the 30th floor overlooking the Imperial Palace. I make the 5km run around these grounds (follow the tree line around) once or twice a week. In the last lesson of the day, my colleagues and I decided to bring our groups together for a final 1 hour group project. The lesson theme for today was project management. So we thought it fit to assign them a group and a project and try to work things out in English using the phrases and communication skills we had just learned. 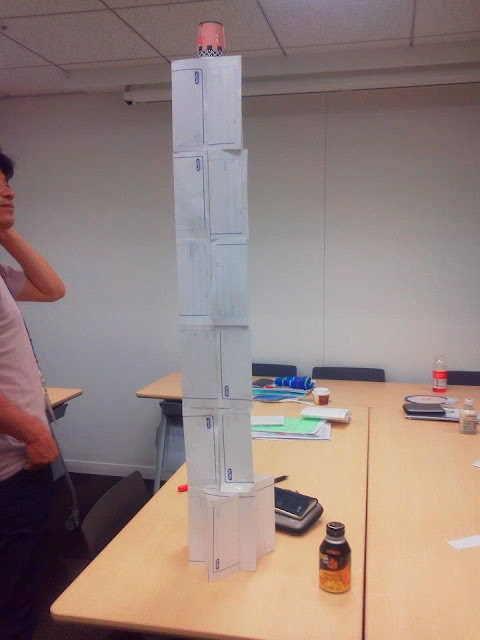 The project was to build a paper tower using a limited amount of supplies. Towers were evaluated based on several criteria including height, aesthetics, and stability. This project incorporated a 15 minute planning session where the group decided their plan of attack. They assigned roles, determined a target structural plan, and so on. It was absolutely fascinating because some of the students are structural engineers and some of the plans they hashed out were amazingly detailed. One group had actually calculated the maximum achievable height based on the dimensions of the paper. Then, after 10 minutes we introduced the first twist of the project, personnel reassignment. We rotated one member from each group to different group siting some plausible reason, such as overseas job transfer. We gave them the remaining 5 minutes from the initial 15 to bring the new member up to speed. 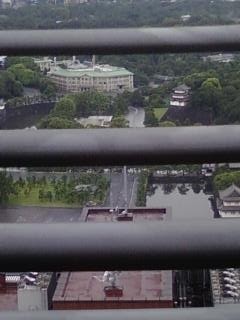 Next, began the actual construction. I caught myself staring amazed and jaw-dropped. These guys came up with some amazing structures. They definitely achieved the use of the target language which was also a great feeling. And then, half way through (they were given 20 minutes to build), we shuffled the groups again exchanging one more member and forced them to reiterate goals and reassign roles in order to meet the deadline. Utter caos for the students, sheer delight for the instructors. It was awesome! Here are their completed structures. 'The Triangle Building' incorporated triangular subunits, a solid base, and received points for being the most likely structure to survive an earthquake! The Inclined Tower, like the others, incorporated triangular subunits. 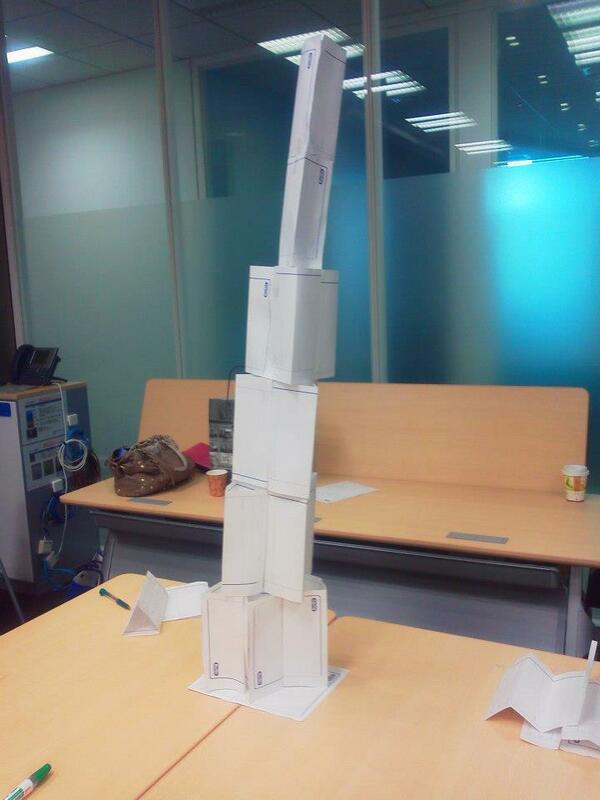 This structure achieved a respectable height. 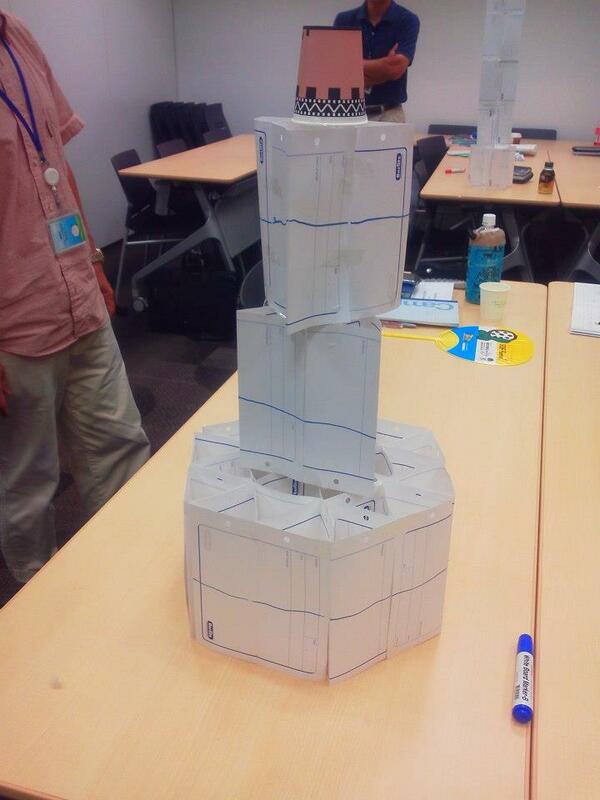 The base consisted of several pieces of paper, one of which was anchored between the two desks. Very clever, but they lost points for aesthetics. As judges, we decided the winner was Unstable Skytree for the unique design theme, stars. We also agreed that the height and overall neat appearance of this structure were contributing factors to the success of Unstable Skytree. Overall, the group project was quite fun to watch. Far more than anticipated. I highly recommend the activity for a group lesson on project management or team-building. Big Shout Out to the big boss Racheyrach. Thanks for the pictures! Amazing lesson, and wonderful results. I hope I'll be able to borrow some of your lesson idea for Japanese students at an advanced level. Unfortunately I teach beginners and high-beginners this semester.